A burly guy barrels through the crowd and pushes aside a petite woman. They have a verbal altercation, her friend intervenes, and a couple of security guards reprimand the offender. Meanwhile, a photographer argues with another guard about where he can stand to take pictures, while a couple of spectators nearly knock over signage to get to the front of the so-called queue, now morphing into a mob. All this for a hamburger. Alas, it is not just any burger. It’s a burger concocted and served by its creator, Bobby Flay, he of Mesa Grill and “Throwdown!” fame who also happened to be hosting the “Chelsea Market After Dark” event that kicked off the inaugural Food Network New York City Wine & Food Festival. But it was Bobby and his burgers that stole the show with his full-sized servings and frequent appearances behind the table to pose for pictures with and chat with adoring fans. 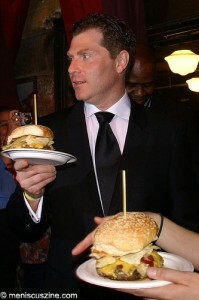 Instead of one of his longtime Manhattan establishments, Flay opted to promote his newest casual dining property, Bobby’s Burger Palace (www.bobbysburgerpalace.com). Unusually, the burger joint is located at a mall on Long Island – the Smith Haven Mall in Lake Grove, to be exact – with every item on the menu, including the frozen cactus pear margarita, below $10. 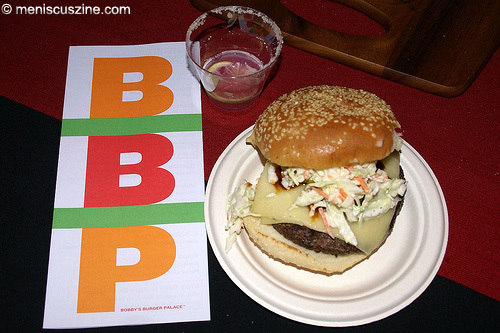 Flay served the Crunchburger (with double American cheese and potato chips between the bun) and the Dallas Burger with pickles, BBQ sauce, Monterey Jack cheese and coleslaw, all wonderfully accented by spices in the bread’s crust. Of course, other vendors passed out some great eats. 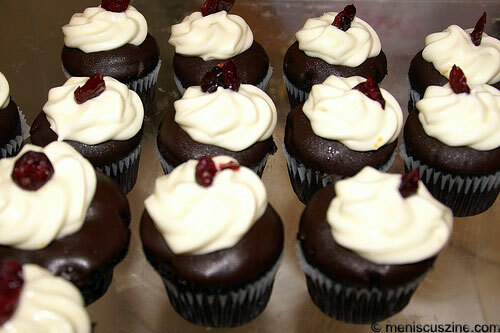 Eleni’s, purveyor of such artistic creations as Obama and McCain cookies, distributed miniature chocolate cupcakes topped with chocolate icing, orange buttercream and a dried cranberry – the refreshing combination simultaneously unusual and unique. The Lobster Place scooped bowls of New England Clam Chowder, the broth with a texture that was just right: smooth, and not too lumpy, creamy or spongy. Equally smooth were the surprisingly thirst-quenching chocolate milkshake samples made by the Ronnybrook Farm Dairy, which sells bottles of fresh milk and doubles as a small diner. 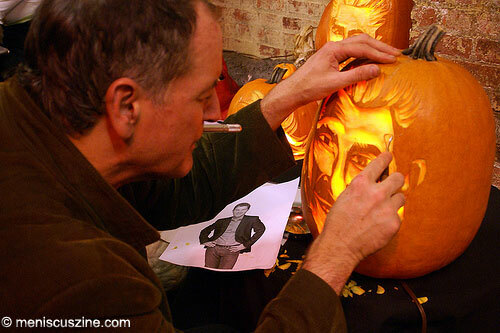 As the evening rolled towards its wine-drenched end, renowned pumpkin carver Hugh McMahon had completed his likeness of Flay on the Market’s newest Halloween decoration, and the chef himself was still serving burgers to snap-happy patrons. And one of those security guards? At least one Crunchburger – “the best” burger he’s ever had, he said – and margarita later, he was dancing the “Roger Rabbit” away from the Flay frenzy to the thumping accompaniment of the live DJ’s tunes. All that from a hamburger. The Food Network New York City Wine & Food Festival runs through Sun., Oct. 12. For ticket information, go to www.nycwineandfoodfestival.com.